Pipe A can fill a tank in 20 hours while pipe B alone can fill it in 30 hours and pipe C can empty the full tank in 40 hours. If all the pipes are opened together. how much time will be needed to make the tank full ? Two pipes A and B can fill a tank in 24 minutes and 32 minutes respectively .If both the pipes are opened simultaneously, after how much time should B be closed so that the tank is full in 18 minutes ? Ans 2. 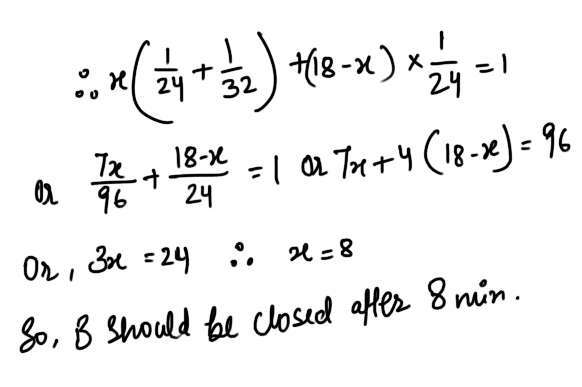 Let B be closed after x minutes .Then,part filled by (A+B) in x min.+ part filled by A in (18-x) min. = 1. A tap can fill a tank in 6 hours.After half the tank is filled, three more similar taps are opened. What is the total time taken to fill the tank completely ? Ans 3. 3 hrs 45 min. A tank is filled in 5 hours by three pipes A,B and C.The pipe C is twice as fast as B and B is twice as fast as A.How much time will pipe A alone take to fill the bank ? 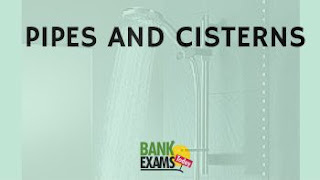 Three pipes A,B and C are attached to a cistern .A and B can fill it in 20 and 30 minutes respectively, while C can empty it in 15 minutes .If A,B and C be kept open successively for 1 minute each,how soon will the cistern be filled? Two pipes A and B can separately in 1 minute and 1 3/5 minutes respectively and a third exhaust pipe C can drain off 30 litres of water per minute.If all the three pipes are opened, it takes 15 minutes to fill the cistern with water.Find the capacity of the cistern. An outLet pipe can empty 2/3rd of a cistern in 12 minutes. In 8 minutes, what part of the cistern will be emptied ? Two pipes A and B can fill in 27 minutes and 45 minutes respectively.A waste pipe C can empty the tank in 30 minutes.First pipes A and B are opened .After 9 minutes C is also Opened.In how mch time will the tank be full? Two pipes X and Y can fill a cistern in 24 minute and 32 minutes respecttively. f both the pipes are opened together, then after how much lime should Y be closed so that the cistern is full in 18 minutes ? Ans 9. Let pipe Y be closed after x minutes . A reservoir takes 20 minutes to get filled up by a fiiling pipe. Due to a leak 1/4th part of water leaks out.Find the actual filling time of reservoir. A tank takes 15 minute to get filled up by a filling pipe, but takes 3 minutes extra due to a leak in the bottom .Find the time taken by the leak to empty the tank. Ans 11. Let the time by the leak to empty the tank be y; the time taken buy the tank to get filled up without any leakage be x; the extra minutes needed to fill the tank be t due to leakage. A pipe fills 1/3rd of a tank in 10 min. In what time would it fill 5/6th of the tank ?